Wendy Mass’s Every Soul a Star, is an intriguing and well thought out story of change and acceptance. Every Soul a Star is a welcoming story of three teens who you wouldn’t expect to be friends. Growing up in the middle of nowhere is no problem for the enthusiastic teen named Ally. Since she grew up there and spent her whole life upon its breaches, and she does have a problem with leaving it all behind. Moving to the city would be hard for her, having no idea what it’s like to live in the real world. The idea of moving to a town that includes bullies, a public school, makeup, designer clothes, and last but not least, friends, seems so treacherous to innocent Ally. On the other hand, there is Bree, the polar opposite of Ally, a total stranger to Ally. A future model, doll faced girl who doesn’t want to leave all of the makeup, designer clothes, and friends behind her, after she is forced to move to the middle of nowhere. There is one more teen to add to the story. Jack, the sit in the back of the class, flunk science, and dreamer type of guy. These three characters are what bring Every Soul a Star to life. After Ally finds out she is moving to a big city, she’s determined to find a reason to stay. When Bree finds out she’s moving to the middle of nowhere, she is also adamant to find a way to keep her regular life. Because of his lack of effort in science class Jack has to attend to summer school, and the only way to escape its walls is to accompany his science teacher on a trip to see a lunar eclipse which happens to be Ally’s house. Ally’s house is the site where visitors, including Jack, see the lunar eclipse. Before everything happens Ally’s family decides to stay and teach the new family that is moving in (Bree’s family) how to tend to the site. That is when Ally and Bree meet. Jack arrives a little later than Bree at the site. After a boy from the science trip has an allergic reaction Jack sprinted to get the boy’s medicine. It just so happened that Ally and Bree saw the whole thing and were impressed by Jack’s heroism. This enchanting and soulful story will make you want to read it over and over. It sends an unforgettable message of unlikely friendships that will last forever. No matter how different or diverse, Jack, Ally, and Bree will always be friends. Until they realise that they could work together, the three slightly despised each other. Ally and Bree try to convince their parents that moving is a bad decision. After functioning so hard together the three start to become much more friendly with each other. later all the memories and jokes they share will always be in remembrance. The three will never forget the time they spent together. 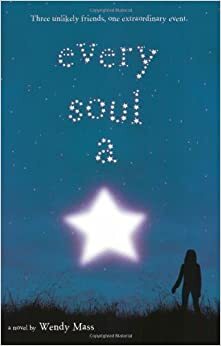 Every Soul a Star has become the most endearing book I have ever read. The way Wendy Mass Tells this surprisingly funny story is very thought out. Her words work together to create such an energetic mood that keeps you reading. The way Wendy Mass depicts the characters personalities just by the words they are saying is amazing. The intricate relationships she’s created between Ally, Bree and Jack helped me understand that friendship does not depend on the same type of traits, it depends on the differences.